Preliminary rendering (courtesy City of Toronto Newsroom). 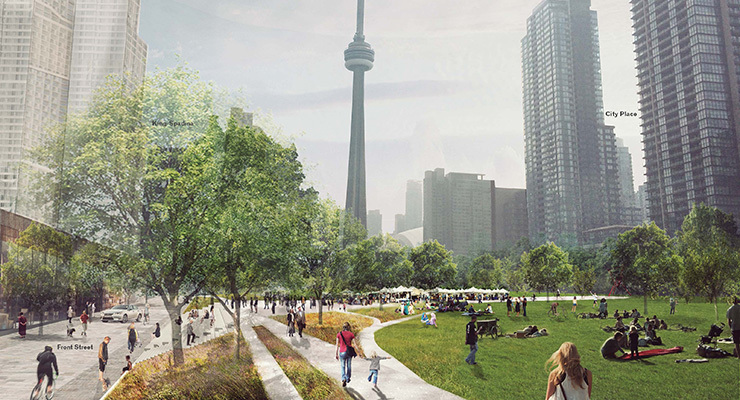 TORONTO – Just months after plans were revealed for the city’s Bentway multi-use area (originally entitled “Under Gardiner”), park-loving residents of the city’s core have something new to look forward to: a proposed 21-acre park to be built atop the railway tracks west of Union Station. Currently dubbed “Rail Deck Park,” the new proposal was unveiled on August 3 by Mayor John Tory and Councillor Joe Cressy (whose ward, Trinity-Spadina, contains the bulk of the proposed space). The project, they explained, is an important of the city’s “TOCore” initiative, which aims to complement rapid downtown condo development with versatile green spaces nearby. “More and more families are choosing to call downtown home, and they need somewhere to play with their kids, enjoy the outdoors and relax with friends,” Cressy said at the event. Extending from Bathurst Street to Blue Jays Way – with the possibility of an extension to the Metro Toronto Convention Centre – the Rail Deck Park would be comparable in size to Christie Pits (21.8 acres) and Eglinton Park (22.5 acres), both of which are located well outside of the city’s South Core. According to the City of Toronto’s backgrounder for the new park, the rail corridor is located immediately adjacent to two of the city’s most quickly-growing neighbourhoods – King Spadina and CityPlace – with a combined population that has shot up from just 1,000 in 1996, to just under 40,000 in 2016. If all proceeds to plan with new applications, that figure could rise by another 30,000 in the years to come. Even though many of those condo dwellers have already begun to start families, they have very little to choose from by way of outdoor play. Of the downtown core’s existing 247 acres of parkland, 75 per cent of the parks are actually “parkettes” – with each one comprising less than 1 ½ acres of land. As noted by the City’s chief planner Jennifer Keesmaat, the park will follow in the footsteps of two previously-completed projects south of the border: Manhattan’s Hudson Yards and Chicago’s Millennium Park. The next key date for the park will be September 22, 2016, when city staff will present report (outlining planning, vision, and strategy) to Council’s Executive Committee.